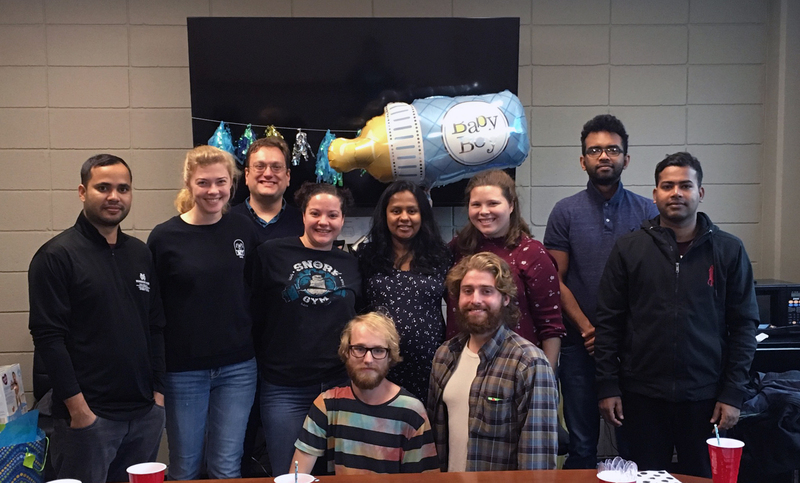 Fitzkee lab (December 2018) at Dinusha's sendoff and baby shower breakfast. Dr. Fitzkee's page is available here. Siddik Alom TBD (New!) Ph.D.
Mack Davidson TBD (New!) Ph.D.
Becca Hill Metabolomics and Quantitative NMR Ph.D.
Kayla McConnell Carbonic Anhydrase / Protein-Nanoparticle Biophysics Ph.D.
Randika Perera Protein-Nanoparticle Interactions Ph.D.
Sharifur Rahman TBD (New!) Ph.D.
Ryan Williams TBD (New!) Ph.D.